Hi! 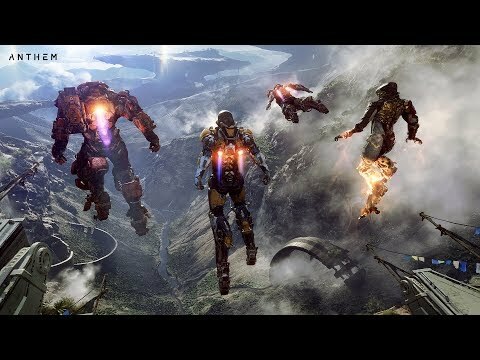 I’m John Warner, Game Director for Anthem. Hey! Freelancer! -Praxley. Listen, there’s trouble. Big trouble. What did you do? A mistake. I hired some… people. They weren’t Freelancers. I know. They said they could handle it. And the price was right. I thought, maybe… -Unbelieveable. You’re right. It was stupid. I’m sorry. But they’re still out there. Somewhere. If you could just bring them back… Anything you need. I’ll get to it tomorrow. -Alright. In the world of Anthem, you and your friends are Freelancers. The heroes who leave the safety of the walls of Fort Tarsus to explore the unknown and protect humanity. Let’s join two players as they head out on an expedition. Hey, Paul! You ready to go? Just grabbing some supplies. Just about ready. What are you going to use today? I decided to go with the Colossus. -I’m going to use my Ranger. Try out some new upgrades. Every player will own an array of Exo-Suits we call Javelins. These suits give players superhuman capabilites and are heavily customizable so they look and play how you want. Bam! Looking good! Nice! You’ve got a mortar equipped. Yeah, I got it on the weekend. You lead the way. I’ll follow. This is a vast open world you explore with your friends. Each Javelin Exo-Suit has its own, unique play style. The Ranger is balanced and all-purpose while the Colossus is a tanking power house Alright, let’s see what’s up here. The world of Anthem is hostile and threats can come from any direction. It’s a dynamic world where the unexpected is around every corner. Uh, I’m not sure we want to use all our supllies on this guy. Yeah, he seems like a problem for another day. You’re the supplier from up ahead. I’ll go low, you flank. Hang in there! Almost there… Ha! Have you been in there yet? I haven’t. We should do that later with Kim. Yeah, he could use the XP. Hello, treasure! I think we got some action up ahead. Anyone! Anyone! We’re under attack! Anyone in the area! We’re under attack! I think that’s part of Praxley’s mission. You can equip your Javelin Exo-suit with gear that brings devastating power to combat. Oh, there are a lot of Scars down there. Oh, the Scars have a Heavy. Time to use that mortar. Give me some covering fire. -Ok. There’s a bunch more coming in. Ok, I’ll get this round. Thanks. Oh come on, be something good! Oh yes! Jarra’s Wrath! -Oh, nice. Large-scale world events like Shaper stories are dynamic and pull you off the beaten path with the promise of new stories to discover. Oh, Shaper Storm incoming. Ok. Actually let’s get some more people. Hold on a sec. Hey, guys. What’s up? Hey! What’s happening? Right behind you. Woah! This storm’s getting crazy. So what are we supposed to do? -Fly into it? Alright! Let’s do this! See you on the other side! Our story is out there. .